For our inaugural podcast our guest is Stephen Greco, Founder and CEO of Spotlight Asset Group. On this episode Steve tells us why he left his position as Director of Wealth Management at the top firm in America to start Spotlight Asset Group. Aaron: This is Aaron Kirsch, managing director at Spotlight Assets Group. 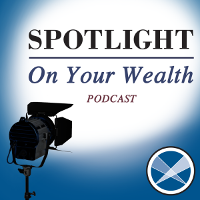 Welcome to Episode 1 of the Spotlight on your Wealth Podcast. Our guest today is Stephen Greco, founder and CEO of Spotlight Assets Group. Welcome Steve. Aaron: Steve, there are over 10,000 independent registered investment advisor firms in the United States, and yet in 2017 you left your position as Director of Wealth Management at the top firm in America to start a new wealth management company. I would love for you to tell our audience about your motivation to do this, but before we talk about your decision to start Spotlight Assets Group, please tell us a little bit about your background. Steve: Sure Aaron. So, I have been in the business for about 16 years. The first half of that was on the brokerage side, the majority of which was with TD Ameritrade. I used to run their downtown Chicago office. And as I got towards the end of my career there, the registered investment advisor space started becoming more and more popular and it was an extremely appealing to me because as a registered investment advisor, you can be a true fiduciary. You didn’t have to sell products, you can only be paid in one way. So I decided at that point that’s where I wanted to spend the rest of my career. At that point I started with an investment advisory group out of Cincinnati where I opened a local Chicago office for them and was there for about two years. At the time I met Peter Mallouk who is the CEO of Creative Planning and they were growing at a tremendous rate. He needed somebody who could help in the Director of Wealth Management space. So, we hit it off pretty well. I decided to join Creative Planning and I was there for about three and a half years and during my time there we grew from 50 wealth managers and about $7 billion in assets under management when I started to around 140 wealth managers and $33 billion in assets when I left. And during my time there I was the Director of Wealth Management. I was on the investment committee and I was managing a portfolio of individual stocks using options, so I just felt that I had done enough where I was comfortable enough to go ahead and go off on my own. Aaron: So, you had plenty of knowledge and experience to start your own company, but what was your motivation to give up being a Director at the number one firm in the country and take on a big risk by starting Spotlight Assets Group? Steve: Well, during my time in the registered investment advisor space I sat down with thousands of clients and, just looking through the frustrations and what I’d seen from the client end of things, most investment companies are really set up to attract and retain assets. They’re not really the best user experience for clients. There’s a lot of hidden fees, not great technology for the end user. And I wanted to set up something that would be different. So, what I tried to do was really reverse engineer what would be the best company from the client user experience, and I wanted to set up something that would be truly geared towards that. So, we decided to start a company that was focused on transparency, technology, and total wealth in order to give clients a better user experience than what I had seen out in the market. Aaron: It sounds like you’ve created a company that is truly client centric, focusing on transparency, technology, and total wealth. Let’s talk about each of these. Steve, how does Spotlight Assets Group think about transparency? Steve: Transparency is a pretty popular buzzword these days. You hear it quite a bit. For us, what it meant was giving clients more insight and control over their own financial situation. So, for example, I can’t tell you how many financial statements I’ve looked at for clients regarding their investment accounts where even me being in the business, I couldn’t tell how much a client was up or down in dollars or total return, nor what they were paying. So, we wanted to create a setup with something just as simple that with statements you can clearly tell at any time exactly what you’re paying. We provide a billing statement to show what your fee rate is, how much you’re paying us in dollars, and then what your net return is, and then that way it’s very, very easy when we start reviews with clients or when they get something in the mail to know exactly where they stand. Also, from the transparency side, we thought it was very important to create a very flat and simple fee system. What a lot of people have gone towards is more of a tiered fee rate for investment management clients where they’ll charge one fee and the first 500,000 and another fee on a next set of money, another fee, and really for a client it’s difficult to see exactly what you’re paying. So, we wanted to create a flat fee rate system that included the commission charges for the trades we recommended so clients would always have a very good idea and could figure out simply exactly what they were paying. And then finally, we wanted to provide an atmosphere where clients would be able to hold us accountable more. We wanted to show clients not only how much they’ve returned in their portfolio, but also give them some benchmarks so that they had some perspective and can judge our performance. It’s very different if you’re up 8% in any given year and the market’s up 9% of the market’s up 7%. It’s a completely different story if you’re up 8% and the market’s up 30%. So, we wanted to provide some perspective for clients so that they could hold us accountable and really know where they stood compared to what was going on in the general market. Aaron: How does Spotlight Assets Group leverage technology to improve our clients’ experience? Steve: So, another frustration I see or heard from clients was that a lot of advisors don’t provide clients with good end technology. So for example, if a client wants to know what their financial plan looks like after a bad month or everal weeks in the market, a lot of times they have to call up their advisor, asked them to rerun their plan, send it to them, and then the advisor can really spin what’s going well or what’s not doing well in their portfolio. We wanted to give clients a portal where their financial plan would update automatically. They could log any account outside of what we’re managing and then allow whether or not we can see those accounts, that way they can have a one stop portal for their banking, for their investment accounts, for what we’re managing and then be able to compare it to other managers and then that way clients would just have more control over their overall situation as opposed to having an asking advisor to rerun things for them and then get back to them. Aaron: You’ve covered transparency and technology. What does total wealth mean? Steve: Well, it starts with an investment management, so obviously most people hire financial advisors to manage their investments and that’s something we do, and I think we do well and that’s also where we get our fees. But, I also thought if you look at where the business is going, in addition to investment management I thought it was important to be able to provide value in other areas. So, if you look at a typical client, they have their investment manager. They’re managing their own investments. They have a separate CPA. They have a separate estate planning attorney. They have a separate insurance person. And it’s really left to the client to have to coordinate all of these items and it’s just natural that some things are going to fall through the cracks. We wanted to position ourselves so that we could fill that gap, help them be the coordinator of all of these different areas and then also be able to provide value in those spaces as well. So, for example, we have the capabilities to be able to do tax planning, tax advice, and also tax returns for clients. We can give clients estate planning advice, we can review insurance. So ultimately, we wanted to set up a one stop shop where we could partner with the client to help give them advice in all areas of their financial life instead of just focusing on the investment management. Aaron: That makes perfect sense to me. Steve, where do you think the financial services business is headed in the future and how will it benefit clients? Steve: Sure, so I think one of the benefits with technology in our society is that you’ve seen more and more of these Robo advisors and online investment management pop up. One of the really good things about it is it’s forced prices down for the end user client, but it’s also provided for a lot more transparency and clients are just more informed these days so they have a better idea of what they’re getting and what they’re not getting. So, for us it was important to, as I said earlier, be able to deal with clients in the most transparent way possible so they always know exactly where they stand and then also be able to provide additional value outside of just the investment management piece. If you can go to a Robo advisor that’s going to manage things for a very minimal fee and you’re going to charge something higher, what is the additional value that you could provide for those clients? And for us we think it’s the customization, the higher end financial planning, and the ability to help a client with all areas of their financial life as opposed to just doing the investment management. The way we look at it, is it’s analogous to if you’re running a business and you hire a CFO to help you run that business, you’re not giving up control over everything from the investment decision standpoint or your financial life. You’re bringing on a partner to help you run things. And that’s the way we view ourselves. Our job is to inform our clients, be a partner for them, and then allow them to ultimately make the final decisions on their own financial future. Aaron: I mentioned in the beginning of this podcast that there are over 10,000 independent advisor firms in the United States and that you decided to start yet another firm. So how is Spotlight different from the 10,000 other companies out there? Steve: I think we’re different in a few areas. So, one: not every investment advisor does total wealth planning, and not only do they think we do it, but I think we do it well. One of the things that we focused on in Spotlight was, before we brought on other advisors and really started to scale up our client acquisition, we wanted to make sure we had experts in every area of what we were looking to do so that we could not just give advice, but make sure we can give the best advice possible. Also, on the investment management side, what you find with a lot of companies is they become experts in one area of investment management. So, for example, they may manage money by just using ETF’s or index funds or they may just use stocks, or they may use a just use mutual funds. What we wanted to do was be able to build out an investment management setup where we can provide the expertise and be able to implement portfolios that used all of these things. So rather than focusing on just one area of investment management, we have portfolios that use ETF’s and index funds. We have individual stock portfolios. We can do individual bonds for clients, we can use options in order to try and create a little bit of protection or enhance income or we can mix any of these, so ultimately what we do with clients instead of having one cookie cutter approach for everybody is we could sit down, customize a plan, and then develop a specific investment proposal for that client that can leverage a lot of different areas of investment management. So, I think that’s one of the ways we’re different for most investment advisors is that we truly are creating customized approach rather than forcing everybody into the same model based on a risk tolerance. Aaron: In other words, Spotlight treats individuals as individuals. Steve: Exactly. A novel concept with investment management. Aaron: Exactly. Steve, you started Spotlight Assets Group with just a small group of people. What has happened since and where is the company going from here? Steve: So. we got approved by the SEC and May of 2017 and we really spent the first 10 months of the business just working with my clients and really trying to set up the company so we could build out the best processes possible to be able to scale the business from there. And we felt in March of this year that we had really gotten to the point where we could really start to scale the company and bring on more advisors. So, at this point we now have four wealth managers, including myself, we have three offices, so our headquarters is in Oak Brook, Illinois. Outside of Chicago we have an office as an Ann arbor, Michigan. and then we also have an office in Los Angeles which is actually in Calabasas. So we have three offices, we have 15 employees and we currently manage about $200, million in assets. So, at this point we’ve grown pretty significantly in a very short period of time. What we’d like to do going forward is continuing to probably add one to two advisors a quarter over the next year or two. But what we’re doing, which I think is a little bit different as rather than targeting specific markets in the US, we’re trying to build around the right partners. So, for example, Ann Arbor Michigan doesn’t jump out to you as a huge market or someplace you would look to put an office in, especially at the beginning stages of a company. But we found a great advisor named Dan Greulich who we thought would be a tremendous asset to the team. So, we decided to build an office around him there and those are the types of things we want to do going forward- finding the right partners no matter where they are and then build out the map from there. And I think going forward we’re just going to continue to look to add as much talent as possible as to our team. I think we’re extremely unique in the way the company is set up. Not a lot of registered investment advisors have somebody who’s strictly dedicated to legal compliance and I don’t know of anybody in the investment management space who actually has a former SEC enforcement attorney as their head of legal compliance. But that’s something that was extremely important to me when I did start Spotlight is that, if we were going to focus on transparency, try to be something different. We might as well find somebody who had legitimate expertise in that area to be able to help us. And, I think a year from now we could be twice the size of what we are now and continue to grow exponentially from there. Aaron: And with that growth, we’ll be able to provide more and more clients with customized financial planning and investment management. So, I am definitely looking forward to that. Steve, before I joined Spotlight Assets Group I asked where the name came from and I would love for you to tell our listeners that story. Steve: So yeah, it’s an interesting story. When I decided to start the company, my wife and I were discussing what we should name it and essentially we started with Spotlight because I wanted to shine a light on the dark corners of the industry, really focused on transparency and set up something that would be hopefully the guiding standard going forward of what investment management company should look like. So, we started with spotlight and then I wanted to start to have a play on my initials. My name is Stephen Albert Greco, so we had the S and decided to try and fill in the rest and asset group came pretty quickly, and we decided to run with that from there. So, it’s a little unique, but ultimately we decided to build the name of the company around Spotlight and the whole focus on transparency. Aaron: Yeah, it’s great to have a name that not only describes what you do, but also has meaning and the message behind it. Steve, thank you for joining us today and telling us the Spotlight Asset Group story. Aaron: Well, this was episode 1 of the Spotlight On Your Wealth Podcast. For Stephen Greco and Spotlight Assets Group, this is Aaron Kirsch. Thank you for listening. Spotlight Asset Group, Inc. (“Spotlight”) is an SEC-registered investment adviser. Registration does not mean that the SEC, or any other agency, has sponsored, recommended, or approved an investment adviser. Being a registered investment adviser does not indicate that an investment adviser has attained a particular level of professional competence, education, or special training. Spotlight has created this website to provide general information about our business and is for informational purposes only. Spotlight does not provide investment advice through this website. Nothing on this website should be construed as investment advice or as a solicitation or offer to sell investment advisory services. No financial, legal, or tax decisions should be made without thorough consultation with properly credentialed and experienced professionals. Any specific situations referenced on this site are for illustrative purposes only and should not be construed as a testimonial. Nothing on this website is meant to represent the experience of a specific advisory client. Each client’s situation is different, and goals may not always be achieved. All investment strategies have the potential for profit or loss and past performance is no guarantee of future success. You can view our latest Form ADV Part 1 and Part 2A on the SEC’s Investment Adviser Public Disclosure website at www.adviserinfo.sec.gov. For additional information regarding our services, or to receive a hard copy of our disclosure documents, please contact us. Certified Financial Planner Board of Standards Inc. owns the certification marks CFP®, CERTIFIED FINANCIAL PLANNER™, CFP® (with plaque design) and CFP® (with flame design) in the U.S., which it awards to individuals who successfully complete CFP Board's initial and ongoing certification requirements.